It's time for another Metamorphosis Monday, hosted by the the ever-so-gracious and talented Susan at Between Naps on the Porch. Please visit Susan to see her latest and to view the list of participants. Thank you to the fabulous Rhoda @ Southern Hospitality for hosting another "Today's Thrifty Treasures" party! Visit her at http://southernhospitality-rhoda.blogspot.com/. She just reached a very impressive 1000 Followers! Make sure and stop by and offer your congratulations, OK? Today I thought I’d share one of the simplest possible transformations. It’s inexpensive, involves only one step, and can make a HUGE difference. Naturally, there’s a story involved. I noticed this rather forlorn-looking lamp on a sale table in an antique shop in Mt. Vernon, Illinois. It’s one of these places one finds open “by chance.” There’s hand-lettered sign on the front door. It suggests calling if you see something through the window that you find interesting. I’ve dialed that number twice now. The first time, the owner returned my call a week later (days after I’d returned to Tennessee!). A year later, I tried again and she answered. She told me she “hoped” to be there around 10am the following day. I returned at the appointed hour, and she was open! The lamp was reduced to $5, which I think qualifies as a steal of a deal. 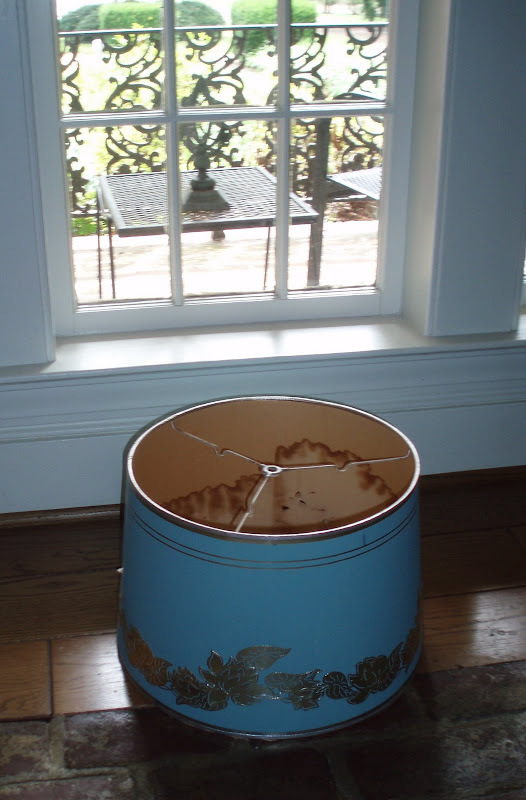 She said it had been owned by a wealthy lady, who’d had it made from a Majolica vase. Everything else from the estate had sold, except for this one piece. I strongly suspect that the lamp’s original shade (which supposedly had been custom made at considerable expense) had been a deterrent. Now I’m always on the lookout for clean-lined, neutral-colored lamp shades and buy whenever I notice one I like (for the right price!) at estate sales, garage sales, retail shops, and thrift stores. Sometimes lamps work better with differently shaped shades, depending on where they’re located in the house. Anyway, I keep shades stockpiled so that, if a new lamp comes into the house, I can try it out with a variety of different sizes, shapes, and colors. The one pictured seemed to show off the old lamp to its best advantage. It sits proudly now on a chest in the entry hall, always at the ready to greet visitors. I’m sure it’s pleased to have left behind the shame it endured in that quaint little shop, overlooked and scorned, being reduced again and again – waiting to be rescued. I found other bargains there that day – I’ll tell you about them in a future post. Do you think the lamp was a good buy at $5? Between Naps on the Porch now has over 300 votes at Blog Luxe under the category of Best Eye Candy... in 11th place! They have them listed by vote ranking now, so you can find BNOTP much faster. Susan's goal is to finish in the top 10! BNOTP only needs 9 more votes to rank in the top 10! There's still two days left to vote, and we're allowed to vote once per day. Click HERE to vote. Oh, what a marvelous lamp! It's truly beautiful and the changing of the shade was wonderful! Can't wait to see what else you purchased! Hope you had a wonderful 4th! Yes! You got a great deal. :) I would have bought it for $5. The new shade looks so much better. I loved seeing this; I have heard that lampshades are like the jewelry of a home, you can change them out and change the whole look of a lamp and a room. You have definitely proven this! What a transformation with the simple addition of a nice-looking shade! The lamp now looks like it cost a lot more than a mere $5.00! Oh, that does definitely qualify as a good buy! And you made it look beautiful! Hello Bill - absolutely a steal! I would have hightailed it out of there and never looked back for that price. I like the new shade too. Very classy. I would have passed this one by and missed out on a great lamp. You have a good eye. I need to learn the foraging tips from all of you guys. Beautiful! Very much worth $5!! I think that pretty lamp was a steal at $5! It looks so much nicer with the new shade on it - Beautiful! What a steal for $5!!!! 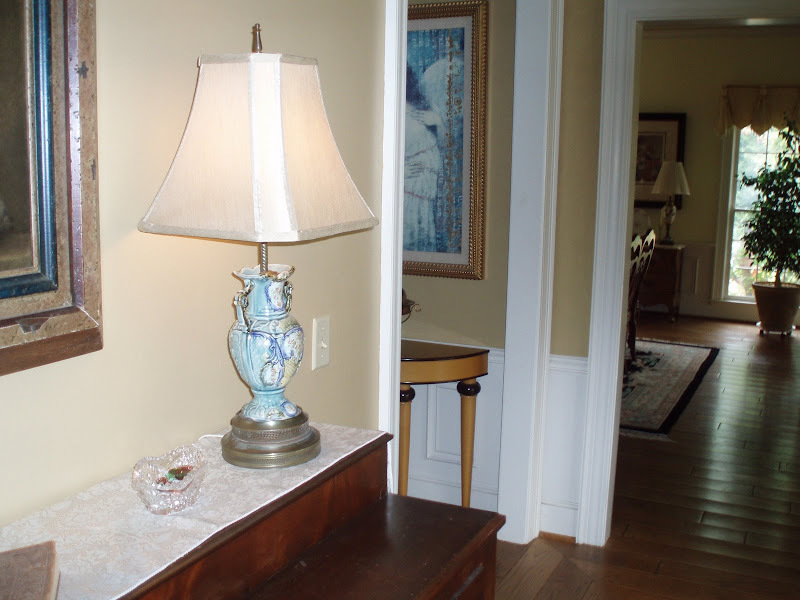 I love the new shade--it really changed the overall appearance of the lamp. Come over to my blog for a visit anytime...You're always welcomed! Stunning with the new shade...but I like the old one too...I can't wait to see where you put that one! Hi, Bill, thanks so much for coming by this week & for your congratulations. I really appreciate that! And YES, that is a steal of a deal at $5. Way to go. Love majolica and it's a beautiful piece. I actually love the shape & color of the old shade, just not that fancy scroll stuff on it. But it would be great recovered, so don't toss it! I can see it covered in burlap & used somewhere else. In fact, I'm gonna need a new shade for my little lamp I just scored. Oh my word. What a transformation. I love it. Man that lamp is beautiful. You gave life to an old piece. How great. I think you got a steal! and your makeover with the new shade increased it's value so much. Great finds! I've been looking for some great lamps and you got so lucky! It's so pretty ... and what a steal for $5.00! I'm looking forward to seeing your other bargains. That lamp was WAITING for you!! Yes, what a terrific bargin and what a lovely spot for it in your home! P.S. It seems like you've been blogging forever! You are very well-spoken! Great buy for $5.00, it was meant to be! The shade looks great on it also! Wow, you are right the shade makes all the difference in the world. It looks so classy and timeless now. Great find, great steal and great job! 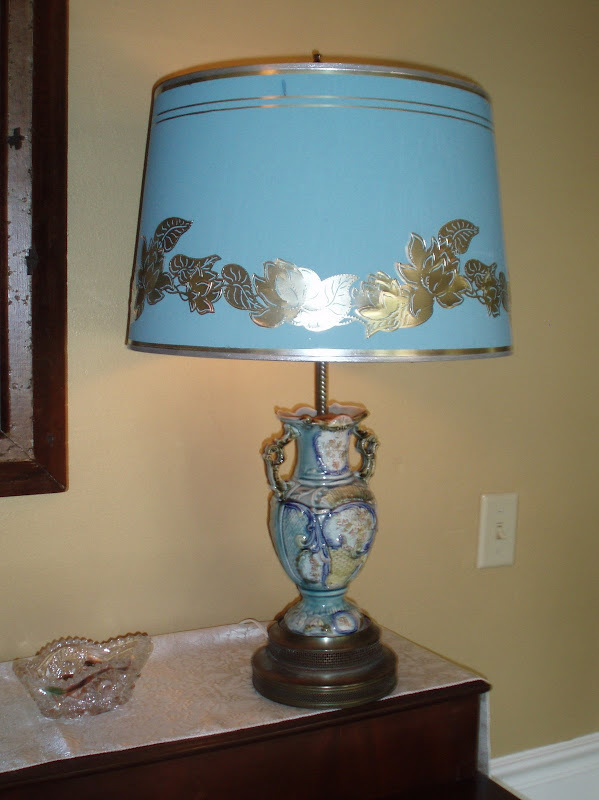 Wow, very beautifl lamp and the shade makes a big difference! The the pretty blues in the lamp! Thanks for sharing! Great transformation! Much better. The other shade was too much competition for the gorgeous lamp. Beautiful! Wow, way to go, Bill! Great metamorphosis! It looks so much better with the shade you found. I love the colors, and you got a great deal on a lamp that looks wonderful in your home. Yea! Beautiful lamp! I know Mt. Vernon as well, use to go there for work meetings. Have a great week! Bill your lamp is stunning! I just the gorgeous details on the base. Oops! Meant to say I "adore" the details. Great story, on how hard you worked to get that lamp! It was worth the effort, and certainly the price! The new shade has given it new life. Love it! Bill-I thought only people in the south conducted business that way :) I think your suspicion about the shade being the deterrant was correct--ewwwwww! The new shade makes an incredible difference! Great deal! oh very elegant! That is a beautiful lamp! 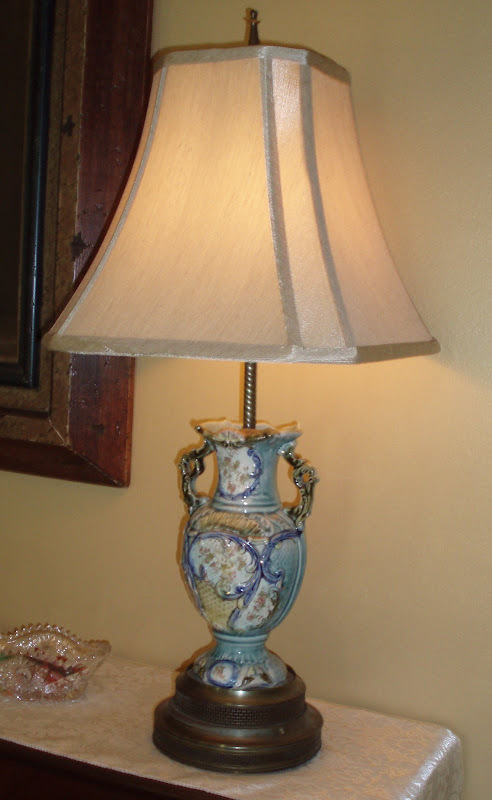 What a fabulous find...I love your pretty lamp and the new shade suites her to a tee ! What a beautiful lamp! Yes, it is a great bargain for $5.00! The new shade is a great change! I've been voting every day, (once a day) lol but thanks for the reminder! I need to get my hinnie out and find some great ones. Love the lamp! What a great buy! What a sweet lamp, and for $5 -- even sweeter! Shades make such a difference. I think you should list that old shade on Ebay -- hey, you never know! Great eye to spot the lamp! ohhhh so pretty! I adore lamps! An absolute steal! It looks great. A good classic shade works wonders. Great buy and excellent transformation! Hey Bill... Enjoyed your story and yes that was a darn good buy. It looks totally different just with that one change. Great transformation! Happy Met Monday! I hope you have a fabulous week! Great buy. I love the transformation the new shade made. Great job! Bill, your perseverance paid off! Great lamp, but even a greater story behind it. You blog is quickly becoming one of my most favorite! BTW, I just loooove a good Mojito! Cheers! Hi Bill, what a great find. Love the shade...perfect mate for the base. yes, great buy at $5.00. Love the shades of blue. I also pick up extra shade for the same reason. Looks great. Isn't it funny how so many will turn their noses up to an item because it has a flaw. That leaves more for us I suppose but I do wish others would give old items a new home. A little paint, putty whatever to bring the item back to life. Great find for 5 bucks if you ask me. If you lived closer I would definitely enjoy thrifty shopping with you. Fantastic lamp and love how you spiffed it up. I also like the warm paint color on your walls. It reminds me of one of my favorites called Tobacco Road. I'm chiming in a little late this week but wanted to tell ya the lamp looks great. The new shade gives it new class. Call me crazy but I really like the old shade as well. I've never seen anything like it. The new shade makes a world of difference! Soooo pretty! Love the lamp! Great blog--first time on it. Mt. Vernon, IL is where we do all our shopping. Groceries and all.